Saadani National Park is the youngest national park in Tanzania. 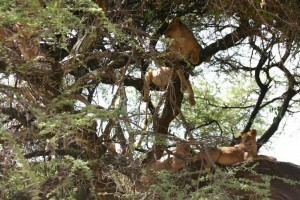 Saadani National Park is located on the Indian Ocean near Zanzibar and approximately 100 km northwest of Dar es Salaam. Park park is almost as large as the IJsselmeer and is characterized by a unique combination of beach, jungle, plains and river. Something you will not see elsewhere in East Africa. The park is an excellent choice for travelers who have already visited the more famous parks of Tanzania and which made no sense to go to the tourist Zanzibar for a beach holiday. This Park is a special and unique alternative. The combination of a white sandy beach and national park bring relax on the beach and safaris in search of wild animals together. The Park has a variety of wildlife that is similar to many other parks. Buffalos, elephants, lions, zebras and various species of antelope are just a few of the animals that live here. Do not look too strange that some animals visit the beach. Unique is the sight to see the ocean or elephants are found in the early morning lion tracks in the sand. Saadani National Park, making it a destination that is ideal to start looking early in the morning to the wildlife and snorkeling in the afternoon on a sandbank off the coast or relax. The Wami River flows through Saadani National Park. Here again to spot other animals such as a large population of hippos, crocodiles, flamingos and many large bird species. In terms of quantity, viewing wildlife or seasonal. You can reach us with all your questions in our office in Arusha, Tanzania. Please feel free to call or e-mail us. The Tanzania travel specialist for safaris, Kilimanjaro climbing, tours, game drives, Serengeti balloon safari, daytrips, holidays, beach vacations and much more, for a perfect carefree Africa experience! Fully tailored to your personal wishes. Tell us your wishes and receive an offer without any obligations. Book a safari to one or more national Parks in the south.